This article discusses the ancient Egyptian goddess Isis. Isis (Ancient Greek: Ἶσις, original Egyptian pronunciation more likely “Aset” or “Iset”) is a goddess in Ancient Egyptian religious beliefs, whose worship spread throughout the Greco-Roman world. She was worshipped as the ideal mother and wife as well as the patroness of nature and magic. She was the friend of slaves, sinners, artisans, and the downtrodden, and she listened to the prayers of the wealthy, maidens, aristocrats, and rulers. Isis is often depicted as the mother of Horus, the hawk-headed god of war and protection (although in some traditions Horus’s mother was Hathor). Isis is also known as protector of the dead and goddess of children. 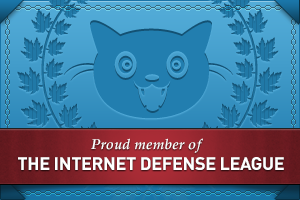 The name Isis means “Throne”. Her headdress is a throne. As the personification of the throne, she was an important representation of the pharaoh’s power. The pharaoh was depicted as her child, who sat on the throne she provided. Her cult was popular throughout Egypt, but her most important templeswere at Behbeit El-Hagar in the Nile delta, and, beginning in the reign with Nectanebo I (380–362 BCE), on the island of Philae in Upper Egypt. This myth became very important during the Greco-Roman period. For example it was believed that the Nile River flooded every year because of the tears of sorrow which Isis wept for Osiris. Osiris’s death and rebirth was relived each year through rituals. The worship of Isis eventually spread throughout the Greco-Roman world, continuing until the suppression of paganism in the Christian era. The popular motif of Isis suckling her son Horus, however, lived on in a Christianized context as the popular image of Mary suckling the infant son Jesus from the fifth century onward. The name Isis is the Greek version of her name, with a final -s added to the original Egyptian form because of the grammatical requirements of the Greek language (-s often being a marker of the nominative case in ancient Greek). The Egyptian name was recorded as ỉs.t or ȝs.t and meant “She of the Throne”. The true Egyptian pronunciation however remains uncertain, because hieroglyphs do not indicate vowels. For convenience, Egyptologists arbitrarily choose to pronounce her name as “ee-set”. Sometimes they may also say “ee-say” because the final “t” in her name was a feminine suffix, which is known to have been dropped in speech during the last stages of the Egyptian language. Most Egyptian deities were first worshipped by very local cults, and they retained those local centres of worship even as their popularity spread, so that most major cities and towns in Egypt were known as the home of a particular deity. The origins of the cult of Isis are uncertain, but it is believed that she was originally an independent and popular deity in predynastic times, prior to 3100 BCE, at Sebennytos in the Nile delta. The first written references to Isis date back to the Fifth dynasty of Egypt. Based on the association of her name with the throne, some early Egyptologists believed that Isis’s original function was that of throne-mother. However, more recent scholarship suggests that aspects of that role came later by association. In many African tribes, the throne is known as the mother of the king, and that concept fits well with either theory, possibly giving insight into the thinking of ancient Egyptians. In Egypt, Isis would have received the same sort of rituals as other Egyptian Deities, including daily offerings. She was served by both priests and priestesses throughout the history of her cult. By the Greco-Roman era, many of her priests and priestesses had a reputation for wisdom and healing, and were said to have other special powers, including dream interpretation and the ability to control the weather, which they did by braiding or not combing their hair. The latter was believed because the Egyptians considered knots to have magical powers. The cult of Isis and Osiris continued up until the 6th century CE on the island of Philae in Upper Nile. The Theodosian decree (in about 380 CE) to destroy all pagan temples was not enforced there until the time of Justinian. This toleration was due to an old treaty made between the Blemyes-Nobadae and the emperor Diocletian. Every year they visited Elephantine and at certain intervals took the image of Isis up river to the land of the Blemyes for oracular purposes before returning it. Justinian sentNarses to destroy the sanctuaries, with the priests being arrested and the divine images taken to Constantinople. Philae was the last of the ancient Egyptian temples to be closed. Due to the association between knots and magical power, a symbol of Isis was the tiet or tyet (meaning welfare/life), also called the Knot of Isis, Buckle of Isis, or the Blood of Isis, which is shown to the right. In many respects the tyet resembles an ankh, except that its arms point downward, and when used as such, seems to represent the idea of eternal life orresurrection. The meaning of Blood of Isis is more obscure, but the tyet often was used as a funerary amulet made of red wood, stone, or glass, so this may simply have been a description of the appearance of the materials used. The star Sopdet (Sirius) is associated with Isis. The appearance of the star signified the advent of a new year and Isis was likewise considered the goddess of rebirth and reincarnation, and as a protector of the dead. The Book of the Dead outlines a particular ritual that would protect the dead, enabling travel anywhere in the underworld, and most of the titles Isis holds signify her as the goddess of protection of the dead. Probably due to assimilation with the goddess Aphrodite (Venus), during the Roman period, the rose was used in her worship. The demand for roses throughout the empire turned rose production into an important industry. Isis nursing Horus, wearing the headdress ofHathor. In art, originally Isis was pictured as a woman wearing a long sheath dress and crowned with the hieroglyphic sign for a throne. Sometimes she is depicted as holding alotus, or, as a sycamore tree. One pharaoh, Thutmose III, is depicted in his tomb as nursing from a sycamore tree that had a breast. After she assimilated many of the roles of Hathor, Isis’s headdress is replaced with that of Hathor: the horns of a cow on her head, with the solar disk between them, and often with her original throne symbol atop the solar disk. Sometimes she also is represented as a cow, or with a cow’s head. She is often depicted with her young child, Horus (the pharaoh), with a crown, and a vulture. Occasionally she is represented as a kite flying above the body of Osiris or with the dead Osiris she works her magic to bring him back to life. 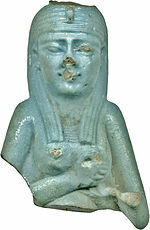 Most often Isis is seen holding only the generic ankh sign and a simple staff, but in late images she is seen sometimes with items usually associated mainly with Hathor, the sacred sistrum rattle and the fertility-bearing menat necklace. In The Book of Coming Forth By Day Isis is depicted standing on the prow of the Solar Barque with her arms outstretched. Isis Nursing Horus.The Walters Art Museum. During the Old Kingdom period, the pantheons of individual Egyptian cities varied by region. During the 5th dynasty, Isis entered the pantheon of the city of Heliopolis. She was represented as a daughter of Nut and Geb, and sister to Osiris, Nephthys, and Set. The two sisters, Isis and Nephthys, often were depicted on coffins, with wings outstretched, as protectors against evil. As a funerary deity, she was associated with Osiris, lord of the underworld, and was considered his wife. Rare terracotta image of Isis lamenting the loss of Osiris (eighteenth dynasty)Musée du Louvre, Paris. A later myth, when the cult of Osiris gained more authority, tells the story of Anubis, the god of the underworld. The tale describes how Nephthys was denied a child by Set and disguised herself as the much more attractive Isis to seduce him. The plot succeeded resulting in the birth of Anubis. In fear of Set’s retribution, Nephthys persuaded Isis to adopt Anubis, so that Set would not find out and kill the child. The tale describes both why Anubis is seen as an underworld deity (he becomes the adopted son of Osiris), and why he could not inherit Osiris’s position (as he was not actually the son of Osiris but his brother Set), neatly preserving Osiris’s position as lord of the underworld. It should be remembered, however, that this new myth was only a later creation of the Osirian cult who wanted to depict Set in an evil position, as the enemy of Osiris. The most extensive account of the Isis-Osiris story known today is Plutarch’s Greek description written in the 1st century CE, usually known under its Latin title De Iside et Osiride. In that version, Set held a banquet for Osiris in which he brought in a beautiful box and said that whoever could fit in the box perfectly would get to keep it. Set had measured Osiris in his sleep and made sure that he was the only one who could fit the box. Several tried to see whether they fit. Once it was Osiris’s turn to see if he could fit in the box, Set closed the lid on him so that the box was now a coffin for Osiris. Set flung the box in the Nile so that it would drift far away. Isis went looking for the box so that Osiris could have a proper burial. She found the box in a tree in Byblos, a city along the Phoenician coast, and brought it back to Egypt, hiding it in a swamp. But Set went hunting that night and found the box. Enraged, Set chopped Osiris’s body into fourteen pieces and scattered them all over Egypt to ensure that Isis could never find Osiris again for a proper burial. Isis and her sister Nephthys went looking for these pieces, but could only find thirteen of the fourteen. Fish had swallowed the last piece, his phallus, so Isis made him a new one with magic, putting his body back together after which they conceived Horus. The number of pieces is described on temple walls variously as fourteen and sixteen, and occasionally forty-two, one for each nome or district. It was said that Isis tricked Ra (i.e. Amun-Ra/Atum-Ra) into telling her his “secret name,” by causing a snake to bite him, for which only Isis had the cure. Knowing the secret name of a deity enabled one to have power of the deity. The use of secret names became central in many late Egyptian magic spells. By the late Egyptian historical period, after the occupations by the Greeks and the Romans, Isis became the most important and most powerful deity of the Egyptian pantheon because of her magical skills. Magic is central to the entire mythology of Isis, arguably more so than any other Egyptian deity. Isis had a central role in Egyptian magic spells and ritual, especially those of protection and healing. In many spells, she also is completely merged even with Horus, where invocations of Isis are supposed to involve Horus’s powers automatically as well. In Egyptian history the image of a wounded Horus became a standard feature of Isis’s healing spells, which typically invoked the curative powers of the milk of Isis. Using the comparative methodology known as interpretatio graeca, the Greek historian Herodotus (5th century BCE) described Isis by comparison with the Greek goddess Demeter, whose mysteries at Eleusis offered initiates guidance in the afterlife and a vision of rebirth. Herodotus says that Isis was the only goddess worshiped by all Egyptians alike. After the conquest of Egypt by Alexander the Great and the Hellenization of the Egyptian culture initiated by Ptolemy I Soter, Isis became known as Queen of Heaven. Other Mediterranean goddesses, such as Demeter, Astarte, and Aphrodite, became identified with Isis, as was the Arabian goddess Al-Ozza or Al-Uzza (العُزّى al ȝozza) through a similarity of name, since etymology was thought to reveal the essential or primordial nature of the thing named. An alabaster statue of Isis from the 3rd century BCE, found in Ohrid, in the Republic of Macedonia, is depicted on the obverse of the Macedonian 10 denars banknote, issued in 1996. Tacitus writes that after the assassination of Julius Caesar, a temple in honour of Isis had been decreed, but was suspended by Augustus as part of his program to restore traditional Roman religion. The emperor Caligula, however, was open to Eastern religions, and the Navigium Isidis, a procession in honor of Isis, was established in Rome during his reign. According to the Jewish historianJosephus, Caligula donned female garb and took part in the mysteries he instituted. Vespasian, along with Titus, practised incubationin the Roman Iseum. Domitian built another Iseum along with a Serapeum. In a relief on the Arch of Trajan, the emperor appears before Isis and Horus, presenting them with votive offerings of wine. Hadrian decorated his villa at Tibur with Isiac scenes. Galerius regarded Isis as his protector. The Greek antiquarian Plutarch wrote a treatise on Isis and Osiris, a major source for Imperial theology concerning Isis. Plutarch describes Isis as “a goddess exceptionally wise and a lover of wisdom, to whom, as her name at least seems to indicate, knowledge and understanding are in the highest degree appropriate… .” The statue of Athena in Sais was identified with Isis, and according to Plutarch was inscribed “I am all that has been, and is, and shall be, and my robe no mortal has yet uncovered.” At Sais, however, the patron goddess of the ancient cult was Neith, many of whose traits had begun to be attributed to Isis during the Greek occupation. You see me here, Lucius, in answer to your prayer. I am nature, the universal Mother, mistress of all the elements, primordial child of time, sovereign of all things spiritual, queen of the dead, queen of the ocean, queen also of the immortals, the single manifestation of all gods and goddesses that are, my nod governs the shining heights of Heavens, the wholesome sea breezes. Though I am worshipped in many aspects, known by countless names … the Egyptians who excel in ancient learning and worship call me by my true name…Queen Isis. 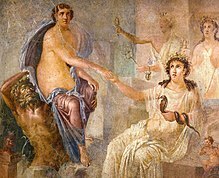 According to Apuleius, these other names include manifestations of the goddess as Ceres, “the original nurturing parent”; Heavenly Venus (Venus Caelestis); the “sister of Phoebus“, that is, Diana or Artemis as she is worshipped at Ephesus; orProserpina (Greek Persephone) as the triple goddess of the underworld. From the middle Imperial period, the titleCaelestis, “Heavenly” or “Celestial”, is attached to several goddesses embodying aspects of a single, supreme Heavenly Goddess. The Dea Caelestis was identified with the constellation Virgo (the Virgin), who holds the divine balance of justice. 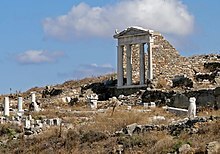 On the Greek island of Delos a Doric Temple of Isis was built on a high over-looking hill at the beginning of the Roman period to venerate the familiar trinity of Isis, the Alexandrian Serapis and Harpocrates. The creation of this temple is significant as Delos is particularly known as the birthplace of the Greek godsArtemis and Apollo who had temples of their own on the island long before the temple to Isis was built. In the Roman Empire, a well-preserved example was discovered in Pompeii.The only sanctuary of Isis (fanum Isidis) identified with certainty in Roman Britainis located in Londinium (present-day London). The cult of Isis was part of the syncretic tendencies of religion in the Greco-Roman world of late antiquity. The names Isidoros and Isidora in Greek mean “gift of Isis” (similar to “Theodoros“, “God’s gift”). The sacred image of Isis with the Horus Child in Rome often became a model for the Christian Madonna with the Child Jesus and many of the epithets of the Egyptian Mother of God came to be used for the Christian Mother of God.